Udaipur. 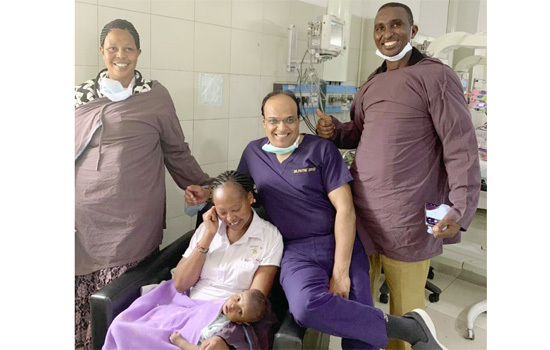 At the tender age of six months Emmanuel Lila Kamank, a Kenyan national, underwent open-heart surgery for a rare cyanotic congenital heart defect known as Taussig-Bing anomaly at Indraprastha Apollo Hospitals. Just four days after his birth, Emmanuel was diagnosed with this heart defect and as his condition worsened, he was referred to Apollo Hospitals, Delhi for surgery. Dr. MuthuJothi, Senior Consultant- Paediatric Cardiothoracic surgeon, Indraprastha Apollo Hospitals, New Delhi explains, “When Emmanuel came to Apollo, he was already cyanotic, which means that he had bluish discoloration of skin due to lack of oxygen in his blood. On examination, it was found that his respiratory rate was below normal at 20 breaths per minute. At the hospital, he suddenly underwent respiratory arrest. The attack was so severe that the child also had a cardiac arrest. His condition was pretty dire due to which he was put on a ventilator and shifted to cardiac ICU.” Dr. Jothi further stressed on the criticality of the baby’s condition, “The child was already diagnosed with Taussig-Bing anomaly, which is a malformation of the heart in which there is a transposition of the aorta to the right ventricle which in the normal case should originate from the left ventricle. At the same time, his pulmonary artery was also wrongly positioned into the right ventricle. This is called double outlet right ventricle defect. Upon further investigation, we found out that there was also an interrupted aortic arch (block in the aorta). On top of that, the child had a large subpulmonary ventricular septal defect (VSD), atrial septal defect (ASD), and Patent ductusarteriosus (PDA), wherein ductusarteriosus, the blood vessel that is open when the child is inside the mother’s womb does not close due to this defect. In addition to all this, he also had a single coronary origin giving rise to right and left coronary arteries. The right coronary had a part inside the wall of the aorta which we call as an intramural coronary artery. This makes it very difficult technically to relocate the coronary arteries into the new aorta. Needless to say, it was a very high-risk case with limited chances of success even with surgery. We devised a treatment plan for the baby but informed his family about the 50-60% surgical risk associated with it. The family consented to the high risk and we decided to go ahead with the procedure.” On 21st January 2019, the child underwent the surgery which was performed by Dr. MuthuJothi and his team consisting of Dr. ManishaChakrabarti, Senior Consultant, Paediatric cardiologist, and Dr. Reetesh Gupta, Senior Consultant, Paediatricintensivist.). It was a very long surgery lasting almost 9 hours.” The operation was a successful one and the baby was shifted to the ICU in a stable condition but with his chest still open, “The chest was kept open for 24 hours because there was a lot of swelling in the heart once we did the operation. Once the swelling came down and the child started passing urine post 12 hours after the operation, we closed the chest in the ICU. After this, the child stayed for nearly a week on the ventilator,” Dr. Muthu explained. Baby Emmanuel slowly recovered and was discharged on the 17th day from the hospital. They kept us motivated throughout the treatment process.” Baby Emmanuel has now gone back to Kenya with his family and is doing well.